On Sunday evening, during the 58th Drama Desk Awards ceremony at New York’s Town Hall, Gypsy Snider and Chet Walker received a trophy for Outstanding Choreography for Pippin. Gypsy created all the circus elements in Pippin, creating multiple tableaus and staging seven circus artists, several of them former performers in other productions with Les 7 doigts de la main. Gypsy started collaborating with director Diane Paulus in 2011, planning the integration of circus in the show. In August 2012, she began rehearsals and show creation at the American Repertory Theater (A.R.T.) in Cambridge, Massachusetts, before coming to New York, where the show had its official premiere at the Music Box Theater on April 25, 2013. “It’s a huge recognition and an immense joy to have the privilege to work with the best. I’m speaking about Chet and Diane, but also about the entire team, all the artists in the show, everyone who has allowed me to live this extraordinary experience. I’ve always believed that circus was an art form of infinite possibilities. Pippin proves this once again,” said Gypsy Snider this morning. The Drama Desk Awards have been presented since 1955, and are the only major New York theater honours for which productions on Broadway, Off-Broadway and Off-Off Broadway compete against each other in the same category. The awards are some of the most coveted prizes in the world of theatre. The Pippin team was honoured three times during the ceremony. 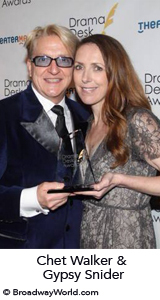 Andrea Martin took the Drama Desk for Outstanding Featured Actress in a Musical; the production won Outstanding Revival of a Musical; and Diane Paulus earned Outstanding Director of a Musical. Keep in mind that Pippin also won Best Revival of a Broadway Show at the Drama League Awards, and earned seven prizes at the Outer Critics Circle Awards. The show, directed by Diana Paulus, has been on Broadway for several weeks, and can already claim to be the most nominated show on Broadway this year, with all the prizes combined. For Les 7 doigts de la main, this is a major recognition, underlining the collective’s work in circus arts as well as its deep belief in the intersection of different genres and art forms.